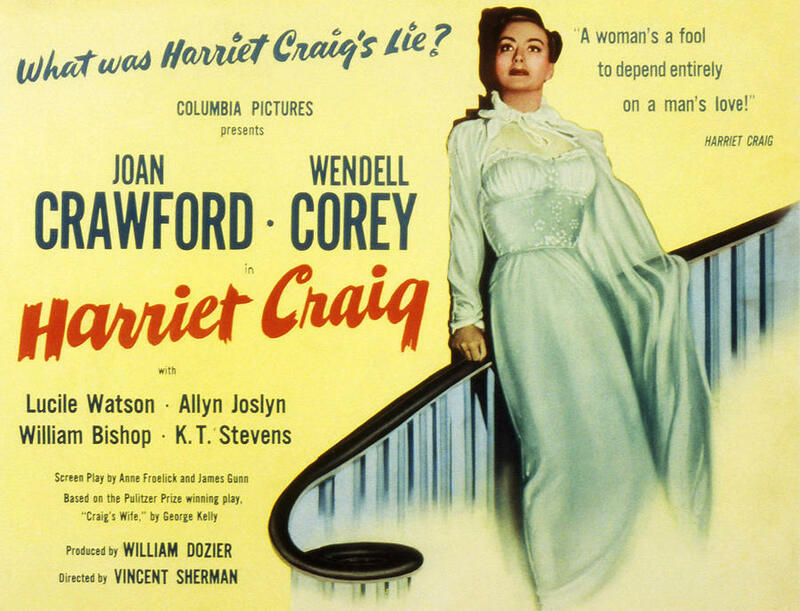 Starring Joan Crawford and two guys who don’t hold a candle to her. What’s The Story? Powerful Congresswoman Agatha (our Joan) is lured to her alma mater to receive an award at their commencement ceremony. She confesses to her secretary Woody (Eve Arden, who steals every scene she’s in with sardonic wit and impeccable delivery) that she had an affair with one of her professors, Dr. Merrill (Robert Young, pre-Marcus Welby by about 16 years) back in the day which lead to her expulsion. Nipping at her heels is Life Magazine photographer Matt Cole (Frank Lovejoy), her old flame from their war correspondent days. As Agatha goes down memory lane at her old college, her romance with Merrill is rekindled. She also brings with her a film about the perils of restricting intellectual freedom, which rankles the college’s head trustee. It’s a good set up for a romantic comedy and the film mostly delivers. Based on Fay Kanin’s play of the same name, the story structure is strong here. Agatha is strong-willed but lonely, good at her job but also wanting love. She’s a woman of conviction in a story that’s all about people compromising their values. The film moves at a nice breezy pace that doesn’t feel too fast. So why does it feel a bit thin? Easy. At 1951, Joan was in the middle of her Warner Brothers contract and her star power was just starting to wane. But Joan Crawford at 90% is still way stronger than most actors. The two other vertices of this love triangle — Robert Young and Frank Lovejoy — just don’t have the star power or the mettle to really serve as a strong equal to Joan. So, she easily blows them off the screen in every scene they’re in. And Lovejoy especially is just out of his element. You buy that he’s a cynical guy, but that is the only note he hits. His Matt Cole is too rough with Agatha to really be considered seriously. And while Robert Young is fine in the role, Cary Grant would have really served a better sparring partner for Joan. Also, every time he was on screen, I kept expecting him to sell me some coffee. Oh, And How’s Joan? One year after Harriet Craig (previous post here), Joan has found a few layers in the Manicured Battle-Axe mode she was in during the 50s. She holds the center of this film quite well. While there are moments where her presentational tics are front and center (see the dazed expression she has when Agatha sees her old dorm room - false notes all around), there are moments where she absolutely shines. There is a lot of talk about freedom and democracy here and Joan sells those moments the best. You can feel that these are the reasons why Agatha got into politics in the first place and her steeliness is how a woman could have survived and thrived in Congress during the 50s. She’s good. Not her best but definitely not her worst. Should I Watch It? Sure. Joan is good, the story is still relevant today and Eve Arden is just genius. It’s not as strong as it should be but it’s still entertaining. How Can I See It? You can rent it from YouTube here and on iTunes.